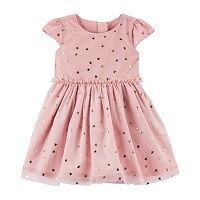 A large selection of discount baby clothes makes JCPenney the best place to shop for all your baby and toddler clothes at really affordable prices. We have all kinds of clearance baby clothes, including boy clothes, girl clothes, baby girl dresses and baby boy dress clothes. Find top brands like Carter's®, OshKosh B'gosh® and Okie Dokie®. Shopping our clearance baby clothes is a great way get all the clothes your need for your little bundle of joy. Babies always look so cute in footie pajamas, and they are a great way to make sure their little toes stay warm if they happen to kick off their covers during the night. Or how about a super cute sleepwear set! Little girls will absolutely adore a nightgown featuring Peppa Pig or My Little Pony. Pick up summertime pajamas made from breathable and cool cotton. 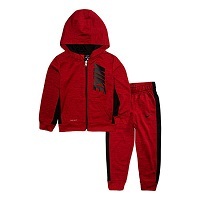 Speaking of sets, we have numerous clothing sets for boys and girls. Your little man will be the epitome of casual chic with a front button bodysuit and jeans set. Get him a pair of baby Converse and he’s ready for playtime adventures, running errands with mom and dad, or a family photoshoot. Give your daughter a stunning tunic and legging set, and she’ll look just as stylish as mom! Next time you're looking for a discount baby clothes, think of JCPenney first. Now that you’ve found the perfect outfits for your baby, it’s time to get accessories! Not only do we have discount clothes, but we also have an impressive array of discount baby and toddler accessories. Bibs are the ultimate necessity. They keep food and drool from getting all over your baby and their clothes. The less stains your baby gets in his or her clothes the longer the clothing will last. Get enough discount baby bibs to rotate through, including holiday inspired bibs! Help them develop fine motor skills and much more with our discount toys. You’ll also find costumes and dolls that help to encourage pretend play. Browse our discount baby accessories and get everything your need for your tyke.